These are a cute, high quality pair of 14k yellow gold lever-back Christian cross earrings, available from Apples of Gold Jewelry. Cross earrings measures 1 1/4" tall (including lever-back closures) x 9mm wide (3/8"). "That I may know him, and the power of his resurrection, and the fellowship of his sufferings, being made conformable unto his death;" (Philippians 3:10). 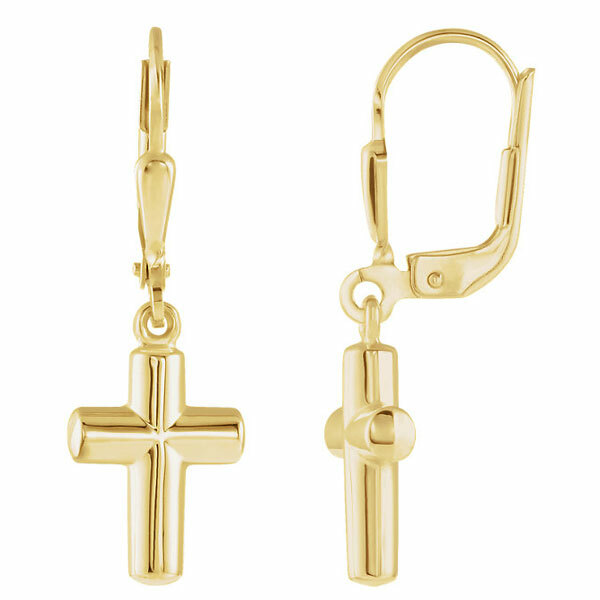 We guarantee our Christian Cross Lever-Back Earrings in 14K Yellow Gold to be high quality, authentic jewelry, as described above.